Laurier English and Film Studies doctoral student Rebekah Ludolph was awarded the Barbara Godard Prize for the Best Paper by an Emerging Scholar at the 2016 Congress for the Social Sciences and Humanities May 28. The prize is awarded annually by the bilingual Association for Canadian and Quebec Literatures (ACQL) as an acknowledgement of the ongoing legacy of York University’s Canadian literature scholar Barbara Godard, who was a mentor to many students and a leader in the scholarly community. 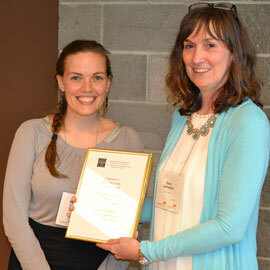 The award was presented by Sara Jamieson, associate professor at Carleton University and president of ACQL. Ludolph delivered her paper, entitled, “Humour, Intersubjectivity, and Indigenous female identity in Anahareo’s Devil in Deerskins,” in a special session on Indigeneity, Redemption, Agency May 29 at the University of Calgary. The award-winning paper explores female Mohawk writer and conservationist Anahareo's (née Gertrude Bernard) use of humour in her 1972 autobiography Devil in Deerskins to address the stereotypes of Indigneous women prevalent in both fiction and the media. Ludolph was encouraged by her supervisor, Laurier English and Film Studies Associate Professor Tanis MacDonald, to adapt her paper into a scholarly presentation for Congress 2016. The prize also includes an opportunity to be published in the leading scholarly journal, Canadian Literature. Supported by a Social Sciences and Humanities Research Council (SSHRC) doctoral fellowship, Ludolph is studying alternative subjectivities, mental disorders and multicultural texts in Canadian literature. Ludolph received her undergraduate degree from Laurier in 2011 and has returned for her PhD.